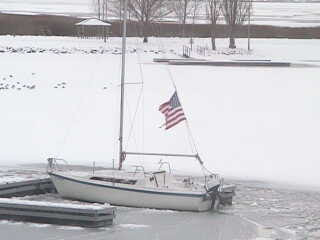 Here's the last boat in the Provo Marina. Looks like this one is stuck until spring. I pulled my boat out Thanksgiving weekend, it was a cold, cold day with a little ice starting to form around the lake. But we got in one last sail, so it was worth it. In the future though, I think I'll plan to pull the boat out on the first 'warm' weekend in the last week or two of October. 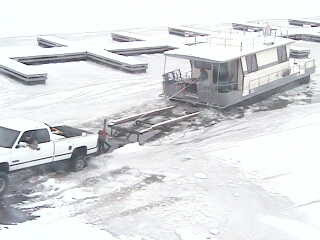 I was watching on the marina webcam as these guys below tried to pull their houseboat out of the water. They had propane torches going on the ramp to melt the ice so their truck didn't slide into the lake. The ice looked to be 2 inches thick already! So now I am just counting down the days til April when we can put the Unsinkable2 back in for the sailing season. I went out this last week and knocked a foot of new snow off her tarps on the side of the house.